There are some stories and times that seem to disappear from the mainstream storytelling. One of those comes to life in Sarah Levine Simon and Mihai Grunfeld's The Dressmaker's Secret, presented by The Simon Studio. Set in 1963 Romania, Simon and Grunfeld's drama follows the story of a woman, her son, and the secret she's been harboring for twenty years. Told in a time of failing trust where secrets and conspiracy are abundant, The Dressmaker's Secret follows the journey of Robi as he searches for the identity of his father, a secret his mother Maria, the dressmaker, has held onto. As Robi goes on the hunt, Maria uncovers the truth behind the past that still haunts her. 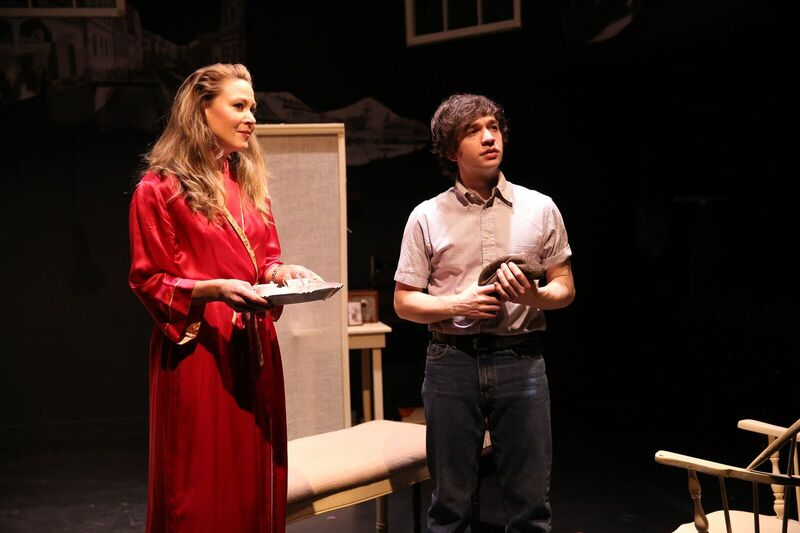 The story, adapted from the novel by Mihai Grunfeld, is a dizzying soap of period drama. Maria wants to keep her secret. Robi wants to find out said hidden secret. And then we get an odd Romanian Mrs. Robinson subplot between Robi and Maria's confidant Irma. And then we get the more than coincidental return of Maria's old love Robert, which shakes things up even more. But as juicy as this all is, it's the inciting induce by that is more troubling. The inciting incident is the discovery of a photo that happened to be out on the sewing table happens so early and far too easily. Diving a bit deeper into characters and relationships prior to the discovery is greatly desired. Simon and Grunfeld's text is quite old school. The dialogue has a heightened aura that creates a presentational feeling within the characters. It’s not colloquial, just period. No matter how the story shakes up, an incredible amount of cutting is greatly desired. There is a plethora of repeated information that bogs down the pacing. It’s hard to say how to not make the piece predictable, but the way the drama unfolds, it’s easy to know just exactly what is going to happen and when it’s going to happen. It’s inherent to the story. There was truth and sincerity in Roger Hendricks Simon’s direction. That being said, Simon’s passive direction forced the stakes to feel minimal. The low stakes dimensioned the power of the story. Whether it was in the text or not, The Dressmaker’s Secret was very much a play about coffee and drinking. In nearly every scene, it’s part of Simon’s action, thusly becoming uninteresting and dull. The scenic design from Stephen C. Jones was practical given the multiple locations. With dress form and sewing machine in full view, we were present in Maria’s intimate home. Where Simon found great success were the beats were he allowed the audience to watch, and listen, to Maria sew. The void of dialogue and sounds of the machine spoke volumes of Maria and the world around her. Jones tried to bring nuance to the black box space by hanging oddly shaped picture cutouts of Romania. The spacing of the images made it feel incomplete. They were unnecessary to the story, but if the visuals were greatly desired, there needed to be a complete collage that overwhelmed the walls. Taking on the lighting design as well, Jones’ lighting was too harsh and bright for the mood of the story. Additionally, it illuminated the space in an unfortunate manner as it reflected off of the white and light-colored furniture. The quartet of actors tried their best to avoid becoming cookie-cutter characters despite the writing. Far and away, the strongest performance came from Caralyn Kozlowki as Irma. Kozlowski has the essence of effortless class and allure. Her character’s twist was easily the biggest surprise and Kozlowski allowed it be revealed beautifully. She kept her secret deep inside. As Maria, Tracy Sallows had to fight the past in a passive way. And yet you felt for her and her storied past. Sallows relationship with Bryan Burton’s Robi was tender but it was Burton, his wide eyes, and Kozlowski who had all the sparks in this play. Though his character was mentioned throughout, Robert S. Gregory as Robert fulfilled the notions of the character. Even through his acts of kindness, Gregory’s Robert was an antagonistic villain. There is a demographic where this play is certainly appealing. But The Dressmaker’s Secret is just bogged down by its length and its lack of stakes.